Canada is a hotbed for tech talent, but the country is slow to adopt new technologies, especially in the enterprise space, says ServiceNow’s Canada country manager. Enterprise leaders are increasingly aware of the need to automate and simplify the workplace, but they’re not always sure how to do that, said LeCuyer. IDC Canada and SAP Canada’s second annual digital transformation report last year reflected this. Out of the 300 Canadian executives surveyed, SAP found that only about four out of 10 are enacting these digital transformation practices. The rest are still in the planning stages. But now, there’s a much greater sense of urgency among enterprise leaders, said LeCuyer, and CIOs are carrying a lot more weight as a result. ServiceNow has also hit the refresh button on its branding. It was outlined by the company’s CEO John Donahoe – “We make the world of work, work better for people.” It’s a message that is resonating with Canadian customers, said LeCuyer, especially when it comes to human resources. LeCuyer said in the next three years, 48 per cent of companies will use platform models, such as ServiceNow’s Employee Service Center, to improve its HR departments. That’s up from 14 per cent today. With large companies such as Google and Amazon betting big on Canada, the talent pool is becoming increasingly difficult for other businesses to tap into, especially banks, telcos and insurance companies. “Foundationally these are the organizations that run our economy at scale and they’re having trouble finding the top talent. These teams are having to evolve and we’re definitely seeing this happen in the Canadian marketplace in real time,” he said. 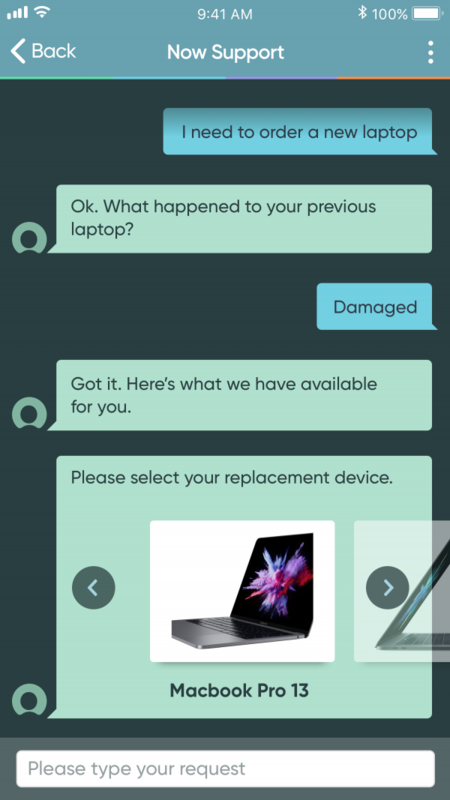 ServiceNow’s new Virtual Agent processing an order for a new laptop. Submitted. A new conversational bot technology platform named “Virtual Agent” will likely become a popular tool in most businesses when it comes out in Canada in Q3, said LeCuyer. Virtual Agent will manage employee or customer requests from start to finish, and will be powered by ServiceNow’s platform‑as‑a‑service, Now Platform. It will also have integration with Microsoft Teams, Slack and ServiceNow chat clients.